This web page was last revised on November 3, 2011. The following is a list of some of our government projects. To abbreviate the list, we have combined some of our related projects into single projects here and have altered the project names. Click a link below to be taken to that specific project. The project consists of repairs and rehabilitation to 223 residential living units, a Community Center, and a Property Management Building. Nearly all are occupied. The project also includes a new maintenance building and a new parking lot. The project includes work at 81 buildings. In addition to compliance with local and State regulations, the project required compliance with HUD regulations and HANO regulations. The work requires coordination with the Fischer Residents' Association and with a Property Management firm. This project is at the end of design phase as of the latest revision to this web page. Construction is expected to begin in 2011. The project consists of partial window replacement at the main school building. In addition to compliance with local and State regulations, the project required compliance with FEMA regulations because of FEMA funding. The building is historic and requires approval from two historic review agencies. This project is in design phase as of the latest revision to this web page. The project consisted of repairs, comprehensive modernization, and aesthetic improvements to 48 apartment units located at 8 properties. Many of the properties were damaged by Hurricane Katrina and the subsequent flooding. One of the project goals was to aesthetically integrate the buildings into their surrounding neighborhoods. All of the properties required work to encapsulate or abate DEQ-regulated materials. In addition to compliance with local and State regulations, the project required compliance with HUD regulations, HANO regulations, UFAS (Uniform Federal Accessibility Standards) regulations, and the "Buy American" requirements of ARRA (the American Recovery and Reinvestment Act). The project consisted of repairs and upgrades to approximately 300 residential living units in 23 buildings at the B.W. Cooper housing development in New Orleans. A majority of the work was performed in occupied living units. In addition to compliance with local and State regulations, the project required compliance with HUD regulations, HANO regulations, and the "Buy American" requirements of ARRA (the American Recovery and Reinvestment Act). The work required coordination with B.W. Cooper Property Management and Maintenance personnel. 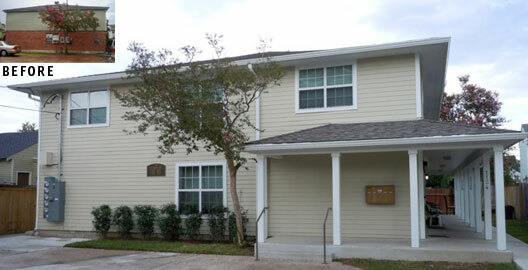 The project consisted of exterior repairs (and incidental interior work) and upgrades to 65 buildings at the Fischer housing development in New Orleans. These buildings contained 123 residential living units and a facility for property management and maintenance. The buildings were mostly occupied. In addition to compliance with local and State regulations, the project required compliance with HUD regulations, HANO regulations, and the "Buy American" requirements of ARRA (the American Recovery and Reinvestment Act). The work required coordination with the Fischer Residents' Association and with two property management firms.